For more information on the class and workshop you are interested in, please scroll down, or give us a call. To register for a class and reserve your space, your class fee will hold your reservation spot. 48 hours are needed to cancel your class and receive your refund. Please bring your own machine needed for all classes and workshops. 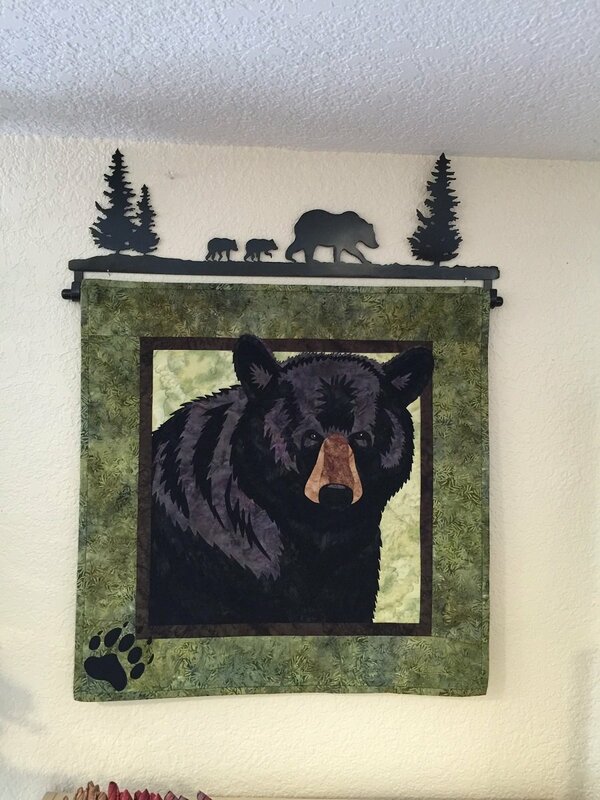 We’ll be making a 40” x 40” small quilt, similar to the sample on display at the shop, from start to finish. 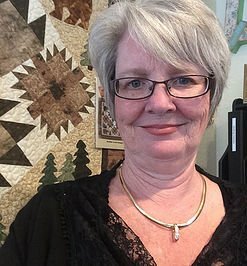 Each class will focus on one or two steps of the quilting process. You’ll learn about the skill, observe demonstrations and ask questions, practice the technique yourself, and then go home with an assignment to be completed for the following class. At the end of the series, you will have mastered basic quilt making skills and finished your small quilt. You will be inspired and ready to go on to your next quilting project! Call for more information, or stop in to sign up. applique. Loving this exciting method. 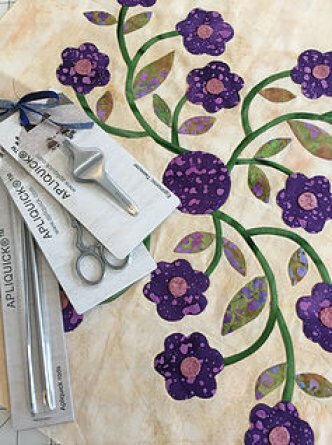 No more starch, small irons, and making your templates with freezer paper This class will also teach you Kim Diels sewn down method..
Are you having trouble with your binding. Need those perfect Miter corners .... 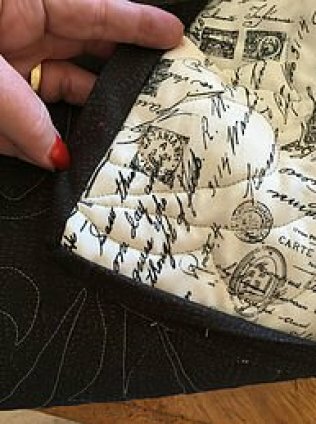 This is a simple class where you learn to put your binding on perfect every time. $ 60.00 including pattern, fabric to make your top. Lunch is included in the class cost. This class will be offered in the summer please call for additional information. 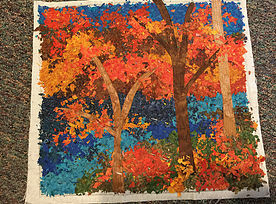 Quilting Impressionist Landscapes based on Noriko Endo method. This class is truly a Big Bear inspiration. Walk thru nature and be inspired by its beauty. Take a picture and then transfer it onto fabric. 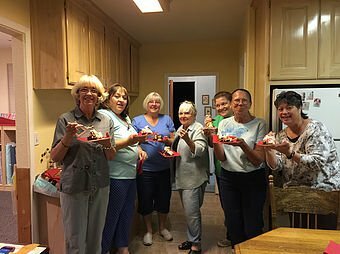 First Friday of the month, 6:00 p.m. - 12 a.m., come join us in your pajama's for some rewarding carefree fun, and relax with friends while you work on your unfinished projects or new ones. 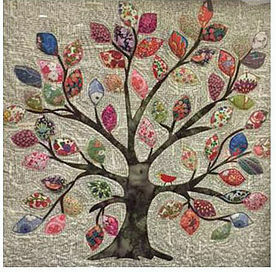 Learn, share and bond friendships together with ladies who have the same passion for quilting. Bear Country Quilts provides you a dessert to spike your sugar level so you can continue sewing until midnight. You never know what your in for. Yum Yum Good.